Searching for a new Oki toners doesn't have to leave you hard up. We have a lower price guarantee which means that our toner for the Oki C9650 DN laser printer are incredibly affordable. Furthermore, we strictly test and validate every last one of our Oki C9650-DN cartridge to be certain you have total customer satisfaction. Forget about paying overpriced high-street pricing because we give you a less costly option. Putting up with a bad quality Oki C9650DN toner isn't ever good for you or your Oki laser printer. For that reason, we offer you a full guarantee so there's no reason to be unhappy. We'll give you a full refund if your Oki C9650DN toner cartridge has not been able to meet your expectations. Order now at Cartridge Save to save. The Oki C9650DN A3 colour LED laser printer is specially made for larger print jobs. Boasting speed and a duplexer, the Oki C9650DN printer is a network-ready device that delivers fast printouts. However, the C9650DN is rather heavy, bulky, and overpriced. The reliable Oki C9650DN is housed in a cube-like frame with an understated appearance and curved edges. The control panel is located in the centre of the front face and is notable for the backlit LCD display, which is big enough and angled for easy viewing of the printer's status. Paper input is handled by the universal tray. Oki gave the C9650DN an auto duplexer to help users save resources. Print speeds are fast, ranging up to 36ppm in colour and 40ppm in monochrome. The Oki C9650DN colour laser printer has flexible media handling features and can accommodate up to 760 sheets at a time. A maximum of 5 trays can be integrated into the device. It prints clearly in high resolution, at 1200x600dpi, so text looks sharp and crisp while graphics look neat and detailed. The Oki C-9650DN is network-ready and can be shared by small groups, but it can also connect to a single PC via USB. Wheels can be installed for easy mobility. The Oki C9650DN A3 printer is mostly criticised for its appearance because it looks too plain and bulky. The Oki C9650DN is a heavyweight, too; at 76kg, it can be difficult to move around. The warranty varies depending on the territory where it is sold, so some users may enjoy the generous 5-year warranty or the limited 1-year warranty. 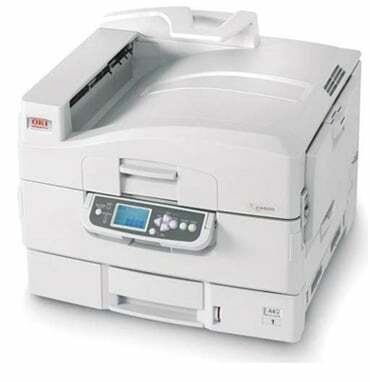 The Oki C9650DN LED printer is very expensive for a single-function machine aimed at small offices.